You might be able to find the most elusive planet – Mercury – low in the southwest sky at evening dusk for this entire next week. This is the best evening apparition of this planet until March 2011. Even so, you will need an unobstructed southwest horizon and a clear sky – and possibly binoculars – to catch Mercury after the sun goes down. Mercury is hard to spot, not because it is dim, but because it so often hides in the sun’s glare. 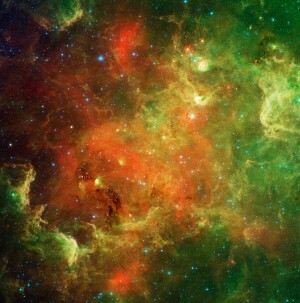 It is actually as bright as a brilliant star. Mercury, the solar system’s innermost planet, will swing farthest east from the sun on December 1, so it is now possible to view in the evening. Look for Mercury near the sunset point on the horizon some 30 to 60 minutes after sunset. About 30 minutes after sundown (at mid-northern latitudes), Mercury stands 6 degrees (3 finger-widths) above a level horizon. 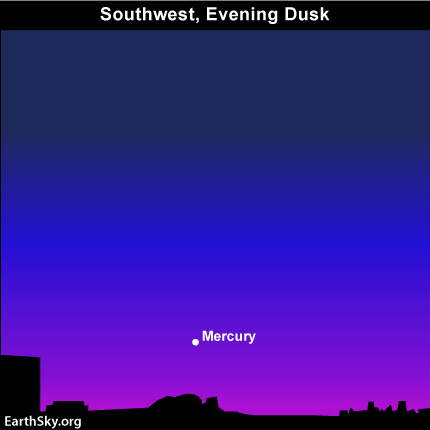 At 45 minutes after sunset, Mercury appears some 4 degrees (2 finger-widths) above the horizon. At 60 minutes after sundown, Mercury hovers one pinky-width over the edge of the world, and then plunges out of sight shortly thereafter. Mercury is easier to view from the northern tropics and the southern hemisphere, because this star-like object shines higher in the southern skies at dusk and sets later after the sun. However, no matter where you live, it will take a deliberate effort to catch Mercury –the god of thieves – as it flits in and out of the early evening sky. Site contents copyright © 2019 Recorder Online	except as noted. All rights reserved. | 86 queries in 2.553 seconds.